KUALA LUMPUR, Malaysia, December 11, 2012 (ENS) – Royal Malaysian Customs today announced their largest ivory seizure ever, a find of 1,500 pieces of elephant tusks hidden in wooden crates built to look like stacks of sawn timber. The ivory, hidden in 10 crates divided between two containers, was shipped from the port of Lomé in the West African country of Togo. It was headed to China, the Selangor State Customs Director Dato’ Azis Yacub told reporters at a news conference today. The shipment transited through Algeciras, Spain before it headed for West Port in Port Klang, one of peninsular Malaysia’s busiest container terminals, situated just outside Malaysia’s capital of Kuala Lumpur. The two containers, declared to be carrying “wooden floor tiles acajou,” were held at Port Klang on December 7 and inspected Monday night. After removing the top layer of the crates, customs officers found the ivory in a secret compartment measuring about one meter deep. Royal Malaysian Customs officials estimate the weight of this giant seizure at between 20 and 24 tonnes. A Malaysian company based at Port Klang is being investigated in connection with the ivory seizure. If convicted, the company could face up to RM500,000 (US$163,500) in fines and individuals a maximum of five years in jail, or both. Azis called on the public to continue providing the customs department with information that would help them stop ivory smuggling. He promised that the identities of informants would be kept confidential and a financial reward would be paid if their information led to a successful prosecution. 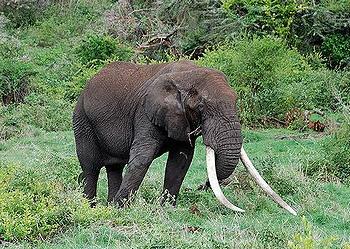 Togo is known to be a major source of ivory exiting Africa. The country is regularly implicated in reported seizures although it has never reported a seizure to the Elephant Trade Information System, managed by the wildlife monitoring organization TRAFFIC on behalf of Parties to the Convention on International Trade in Endangered Species, CITES. “TRAFFIC commends the Customs Department on its vigilance and hopes to see it pursue all leads towards finding the criminals that are using Malaysia as a transit point for ivory,” said Dr. William Schaedla, TRAFFIC’s director in Southeast Asia. “We also urge authorities to ensure proper systems are in place to catalogue and stockpile the seized ivory,” said Schaedla. TRAFFIC is encouraging all the countries implicated in the seizure to investigate this case thoroughly, so that those behind the shipment can be traced and brought to justice. This is the fourth seizure of African elephant ivory at Port Klang and the sixth in the country since July 2011. 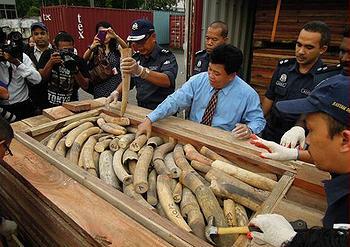 In September 2011, 695 elephant tusks weighing close to two tonnes were seized in Port Klang. Another seizure in December 2011 yielded 1.4 tonnes of ivory, and in January, a consignment weighing 0.49 tonnes was also seized there. Seizures have also been made in the Malaysian ports of Penang and Johor. This year customs officials seized 1.5 tonnes of smuggled ivory in Colombo, Sri Lanka in May; just under one tonne in New York in July; and two shipments in Hong Kong – one of 3.8 tonnes in October and another of 1.33 tonnes in November, among other seizures. Experts estimate that between 20,000 and 30,000 African elephants are being illegally killed each year to fuel demand, primarily driven by China. And the situation could get worse in the near future. With only three months until the next meeting of 176 Parties to the CITES Convention, Tanzania is seeking approval for the sale of more than 100 tonnes of stockpiled ivory to China and Japan. Analysis by Born Free’s trade experts concludes that, far from meeting demand and depressing poaching, legal ivory sales fuel demand and provide incentives for another wave of slaughter. Born Free, together with other conservation charities with many years of experience working in Africa, are asking Tanzania to withdraw its proposal. They are calling for China and Japan’s status as ivory trading nations to be revoked and for the international community to come forward with the resources necessary to fund the African Elephant Action Plan, the only blueprint for elephant survival agreed by all 37 African elephant range states.